Being a native Floridian, I don't get to watch the seasons change as much as I'd like to. I've only been in snow 2 times in my life and if you ask me, (at least majority of the years) the only way you can tell the seasons are changing here are by the seasonal flavors at Starbucks like Pumpkin Spice, or Ginger Bread Lattes. This is about the time of year I wish we had more leaves changing in Orlando. I absolutely love the smell of backyard bonfires, pine cones, pumpkins & anything with a Fall scent. I love the warm fall tones like reds, oranges, and yellows and if I had my way I would decorate the whole house with these colors during the Autumn months. There's only 1 little problem with that idea...I can't justify spending extra money on seasonal decor, just to take it back down a few months later. Decorating your home with pumpkins, autumn leaves, pine cones and straw is super fun and homey if you ask me & kudos to anyone out there who can pull off a whole house transformation this time of year. 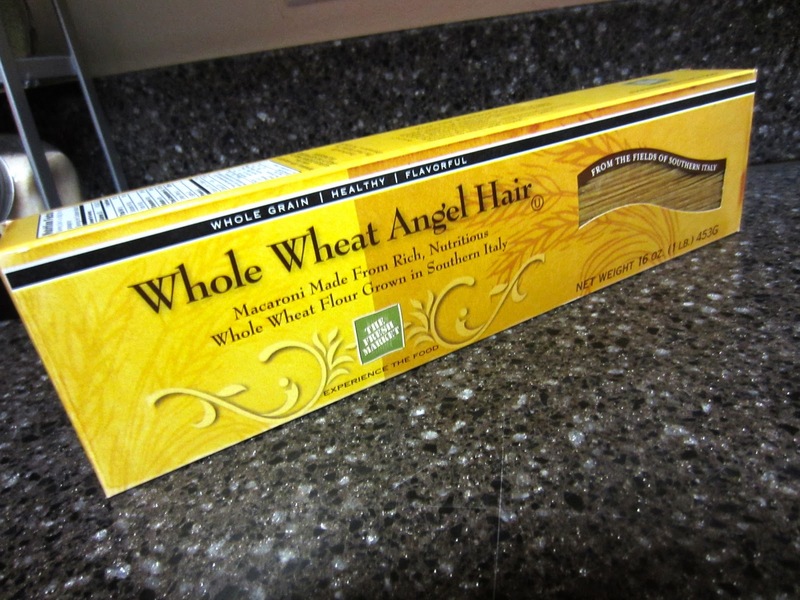 As for me, I like to keep things on a budget and limit myself to purchasing 5 things per season. *TIP: Avoid going to department stores for seasonal purchases. Discount decor stores like Michaels, TJ Maxx, Stein Mart, Home Goods, and even Target are a great way to decorate on a budget and have a variety of cute, affordable styles to choose from. There are tons of ideas out there on how to decorate for the seasons on a budget. I don't know what it is about them, but I've always loved hanging wreaths on front doors, even when I was growing up. This is a great way to set the seasonal tone for your home, even before you go inside. This was my most expensive purchase, I got this one at Home Goods for right under $25. As much as I would like to buy out the entire Bath & Body Works fall collection, I didn't. I actually found this Pumpkin Spice candle at Home Depot, last year after the Holiday Season for $6. *TIP: We like to shop after the holidays are over to get 50% or higher OFF of seasonal products. Halloween costumes, candles, serving plates, and towels are great examples of things you can stock up on post Holiday Season. I found the red pumpkin towel at Home Goods for $3.99. It came with a red and orange dish towel, but I got home and saw that it matched the towels we already had up perfectly. The green & orange towel set came from Crate & Barrell and was a wedding gift to us. I LOVE those colors! I'm not embarrassed to say I've been that person sitting in the isles smelling different bags of potpurri until I find the perfect one. It wasn't even the cute little pumpkin packaging that drew me to this one. This combination smells SOOOOOOOOO good! Pinecones, roses & pumpkins is the best way to describe it, and my husband surprisingly loved the wire pumpkin it came in. Once again, this purchase was part of my Home Goods trip & originally I wanted to take the potpurri out of the container and put it on our coffee table in a glass bowel. I found out the wiring doesn't separate, so we're now enjoying the pumpkin accessory & potpourri on top of our fish tank for $12. Just like scented candles, my favorite scented hand soap is Bath & Body Works. I plan to stock up on B&BW soaps when they have their Black Friday Sale, but until then my handy dandy Spiced Pumpkin hand soap from Home Goods will do for $4. Putting seasonal soaps throughout your home is an easy way to spread holiday cheer, starting with pumpkins or autumn leaves. 5 easy ways to decorate your home for Fall! *BONUS TIP: Are you a fan of B&BW Wallflowers? We are for sure. We have at least 6-8 going in our home at any time and take advantage of the semi-annual and seasonal sales they have. We purchase most of the wallflower re-fills online, and if you time it right you can purchase for free shipping and 20%OFF coupon savings. Pictured above is Spiced Cider for the holidays, but you can find all of the fun fall starters and smell good scents in stores and online: B&BW Wallflower Collection. How do you decorate for Fall? Feel free to share tips and comments below and stay tuned for more Fall Inspired posts as we get into October and closer to the Holidays. We all go through hard times. We all become frustrated. We all are challenged, and we all get in those "I want to run away where no one can find me" funks. You are the only one who can choose to give into it, or pray about it, find peace and move forward. I'm sure a lot of you are aware that Scott and I are currently going through some crazy life changes. We recently get married, but the changes keep on coming with both of us currently looking for the next chapter in our lives to start. There are days where we truly live the life of newlyweds before kids by experiencing Orlando, going out to eat, seeing movies, going to events and going out with friends. Other days it's rough...not knowing what's next in your lives can be pretty frustrating. It's easy to get caught up in our obstacles, forget what we have going for us and obtain negative outcomes. The only thing that gets me through times of uncertainty is count on my faith, and find peace in what the Lord has in store for us. My Word of Wisdom (WOW) this Wednesday? 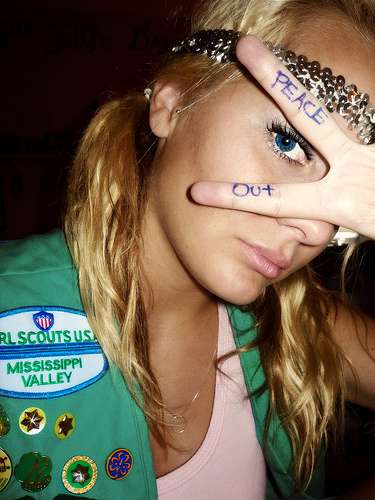 Turn from evil, and do good; seek peace and pursue it. As of right now, the only thing keeping us in the city we currently live in is family. We are both at a point in our lives where we could pick everything up at any given time and are considering moving to another city, state or even country. That is such a cool feeling, but it's also unbelievably frustrating and scary not knowing what's next in our new lives together. I would be lying if I said I didn't miss the life we had together even just a year ago...it seemed like we figured everything out. But, seasons change, jobs change and so do lives. Instead of dwelling on what we don't have going for us, accept your life for what it is today. Your future depends on an optimistic attitude and trusting that the Lord has a plan for you. Find peace in the situations around you and move forward. With that, we're taking one day at a time...getting the most out of our time together and looking forward to see what's in store for us. Vacations are GREAT, but there's always one drawback about them...getting back to reality when you walk through your front door. After being gone (and away from any kind of exercise) for almost an entire week, I knew it was time to fit in a quick & effective workout ASAP! Cardio is always a great way to get out of that lazy, vacation frame of mind and jump-start your way into a healthy, active & motivated lifestyle again. I started my first Work It Out (WIO) post to the series last week, and you can read all about it here if you missed it: WIO: Cardio Interval Training. Originally, I wanted to include this workout on my first WIO post, but I decided not to...I didn't want to overwhelm anyone with too many choices, numbers to crunch or ways to run on a treadmill all at once. 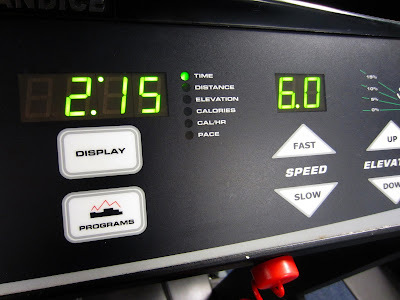 So, here is my PART 2 to my first interval training post, and it's called the 6,7,8 workout. I got this one from a dancer friend of mine, Danielle and we always turned to it whenever we needed to sweat a lot and kick our booties into shape! *WIO TIP: Always do a quick stretch before a running workout targeting your legs, calves, back and arms. I also encourage setting yourself up with music, or watching television if you're inside of a gym equipped with one. There's nothing worse than being bored during a workout. Distracting yourself with some kind of entertainment will help you to stare at the clock as a time reference, not to count down time remaining in your workout. *Unlike my first interval training post, this particular workout requires a treadmill. Start your 6,7,8 interval workouts with a warm-up walk for 2 minutes at a 3.5mph speed. Every treadmill is different, so if you're not sure about how fast you should be going, it should feel like you are power walking, or taking a brisk walk. When you hit the 2 minute mark, up the speed to 6.0 mph and run at that speed for a minute. I started 6mph at 2:00, but it was tricky to get that picture! 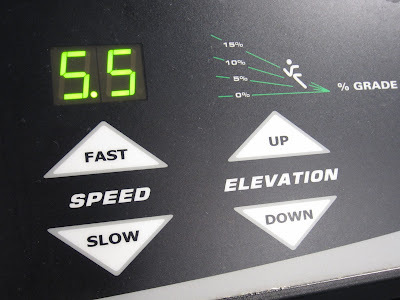 After your 6.0mph minute run, up your speed to 7.0mph and run at that speed for a minute. When you complete your minute 7.0mph run, finally up your speed to 8.0mph and complete your first 6,7,8 set by running at that speed for a minute. You're going to be pretty winded after your first interval set, so take your 5-6 minute to recover by bringing the speed down to your warm-up walking speed of 3.5mph. 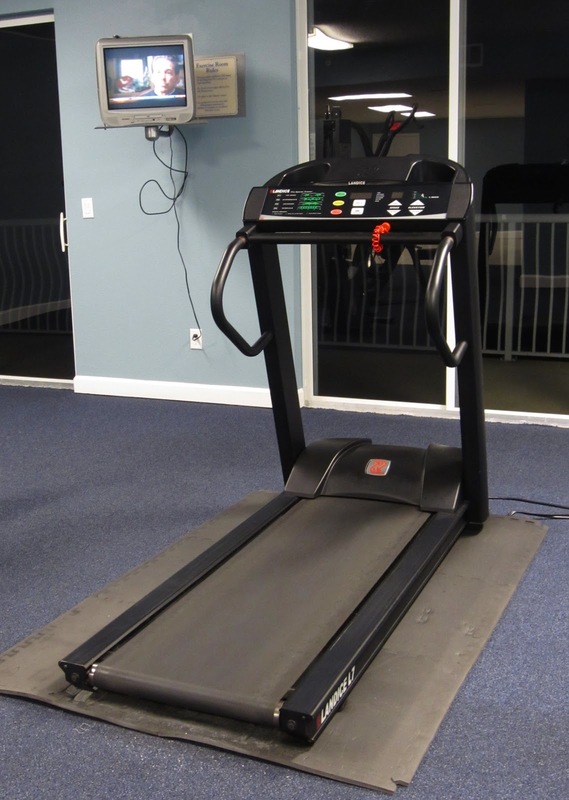 If you need to take a breather before you begin walking, you can opt to rest while re-setting your speed to 6mph by splitting your feet on the sides of the treadmill, removing them from the belt. 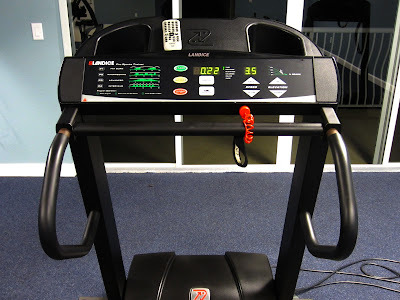 Use the handlebars of the treadmill for support, and place your feet on the sidebars. *NOTE: It's better to recover from your 8mph sprint by walking, but by all means do what you need to recover and get your ready for your next 6,7,8 interval set. When you hit the 6 minute mark, it's time to start your 2nd set of intervals. At 6:00, start to run at 6mph for a minute, and repeat the 7:00 at 7mph and the 8:00 at 8mph. If you plan to do a weight training workout during that trip to the gym, I usually opt for the 3 interval sets 2 x through. If I'm just there to do a quick, intense cardio workout I go for the 4 straight sets 1 x only. The first time you try this workout, it's probably going to be a challenge to get through 3 consecutive sets and that's completely fine. Everyone reading this has different workout regimes, are on different health & fitness levels and like different difficulties of workouts. *Do what's best for YOU! Do the first 3 6,7,8's after your warm-up and take at least 2 minutes to cool-down out of your 3rd 8mph minute run. Use the next 30 minutes, or however long you need to complete your workout outside of cardio for that day. When you're done with the majority of everything else, start to close your workout with your second 3 sets of 6,7,8's. 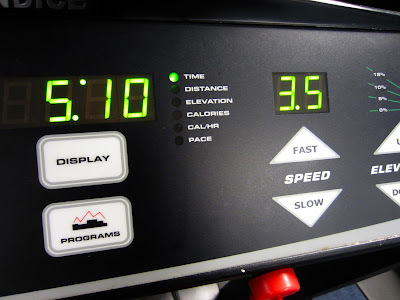 Between the 2 reps of doing 3 interval sets, you will be on the treadmill for around 35 minutes. Start your first 6,7,8 interval after your warm-up and repeat pattern of 6,7,8 and rest minutes 3 more times. Your final 6,7,8 interval set will begin at the 15 minute mark with 6mph at 15:00, 7mph at 16:00, and 8mph at 17:00. Use the next 5 minutes, or however long you need to gradually make your way back down to walking warm-up speed of 3.5mph. 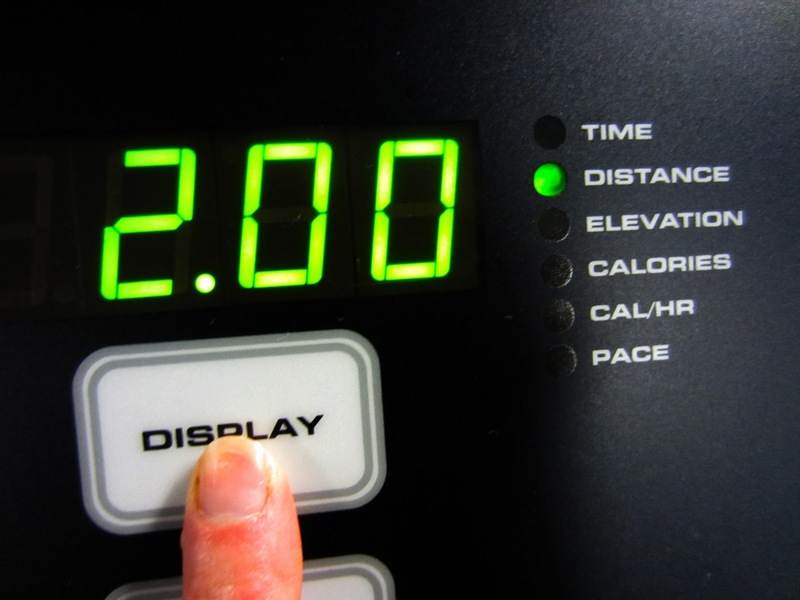 With this version, you will hit the 2 mile mark just around 20 minutes. 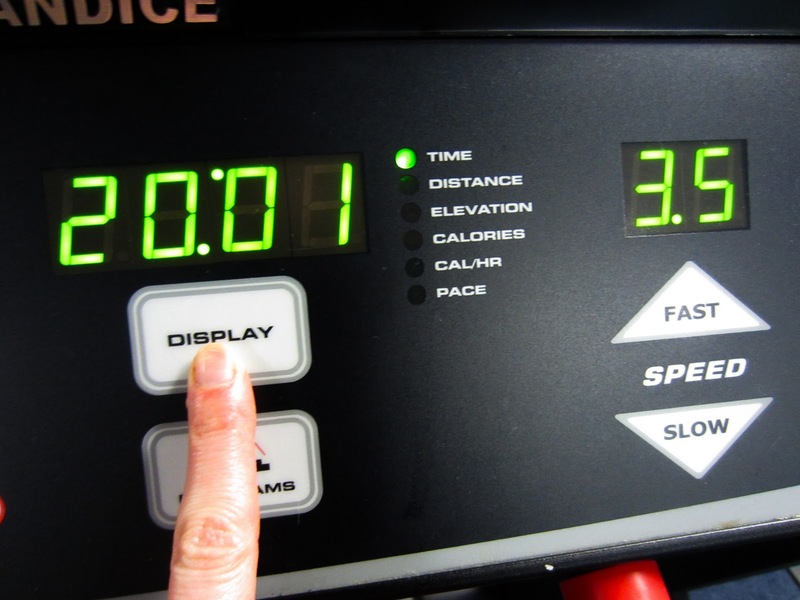 Cool down by walking at 3.5 mph until you're ready to get off of the treadmill. Interval workouts have been a key to keeping my cardio routine challenging. Research shows that interval training burns more fat and calories than steady paced runs or jogs. I'm excited I got to finish sharing my cardio interval training workouts with you! (for now anyways). And with that, my second part of interval training for you is complete. Stay tuned for more cardio & WIO tips & let me know if or how interval training has helped you! Yesterday for whatever reason I became emotional, moody and at times quickly annoyed and angered at petty things. We all have those days where every little thing affects you, your thoughts and/or your actions. Being a girl filled with estrogen doesn't help this case and for this week's Word of Wisdom Wednesday, I decided to see what the scripture suggests us to do to avoid giving into these emotional funks. If only controlling our emotions was that simple! We are all human and at one point or another we are ALL guilty of having selective hearing, speaking before we think, and getting angry about something small. I know I am guilty of everything I just listed...what about you? Nobody's perfect. 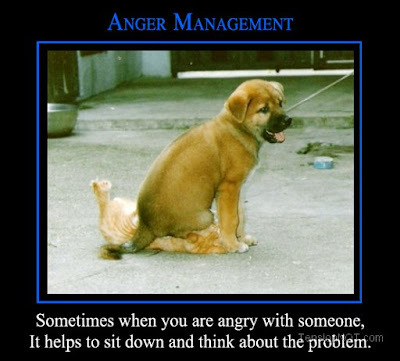 We all have tempers and we all let our emotions get the best of us sometimes...it happens. But is it okay? The Bible is here for us to reference or go to for everyday reading, prayer and learning. 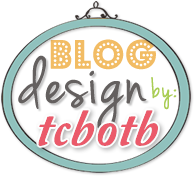 I'm sure there are people reading this who think I'm crazy for dedicating a post to the Word EVERY Wednesday on my blog! But for me, reading scripture inspires me to be the best person, wife, friend, neighbor & believer I can be. Living up to my full potential makes me happy. Whenever I have questions, concerns or queries I always know where to turn to. Whenever I get angry, upset or completely at a loss about a situation, my first instinct is to remove myself completely. Once I calm down, I start to access what happened and majority of the time I see that an argument or my feelings of anger came from something that has nothing to do with the situation at all. James 1 says to "be quick to listen." How many of us can honestly say we listen to what anyone at any given time is telling us and putting our complete attention towards them? Not many I'm sure, with myself being included in that group. I can't tell you how many questions, mistakes and even arguments I could have avoided, if all I had done was really listened to what someone was telling me. Be "slow to speak and slow to become angry," IE: bite your tongue and think before you speak. If you have an outspoken or strong personality, this can be something extremely difficult to do. When people argue there are usually things said that nobody really means to say, and they will then come back later to say "you know I didn't really mean that, right?" The solution to this? The book of James is clear by saying think before you open your mouth! If what you are about to say might be taken the wrong way or even offend the person you're talking to, maybe you shouldn't say it. On the other side, don't take everything so personal and become quickly angered from it. There is usually an explanation to every situation, and there's no room to hear the other side of the story if you don't give the person a chance! LISTEN, THINK and respond only after you've done so. One last thing about this verse...it mentions that failing to follow these steps does not result in a "righteous life that God desires." To me this sounds like ignorance, offensive words and a quick temperament is not part of a righteous (or even happy) life. 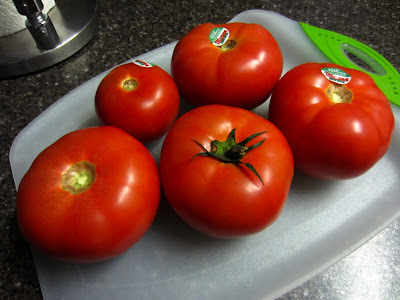 I had a request to share a low-cal, low-carb tomato soup, so I was on a mission to find one. Before anywhere else, I looked in my favorite new cook book Cooking to Conceive, and found this great recipe right here at home. I remember seeing it when I bought the cookbook, because it was one of the recipes I was anxious to try. Mission complete! This soup turned out GREAT and I paired it with a cool cucumber salad as a great lunch or dinner combo. Since the soup was my focus, you'll see the salad recipe second. This simple low-cal soup is a great way to enjoy an alternative to the traditional cream-based tomato soup. The whole-grain croutons dissolve into the chunky, rich soup, giving it texture. 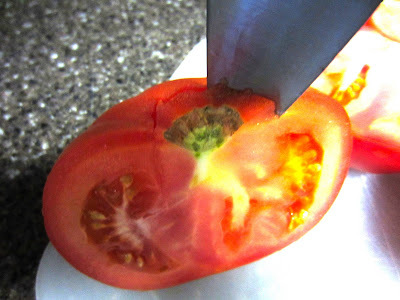 To cook soup: Core tomatoes and cut in half crosswise. 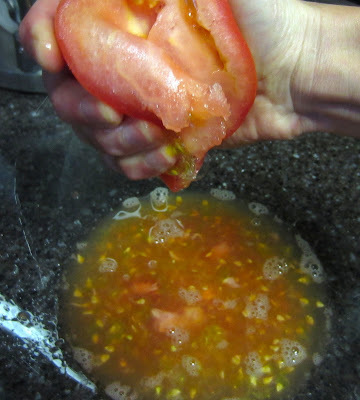 Gently squeeze over a large bowl to catch juices. 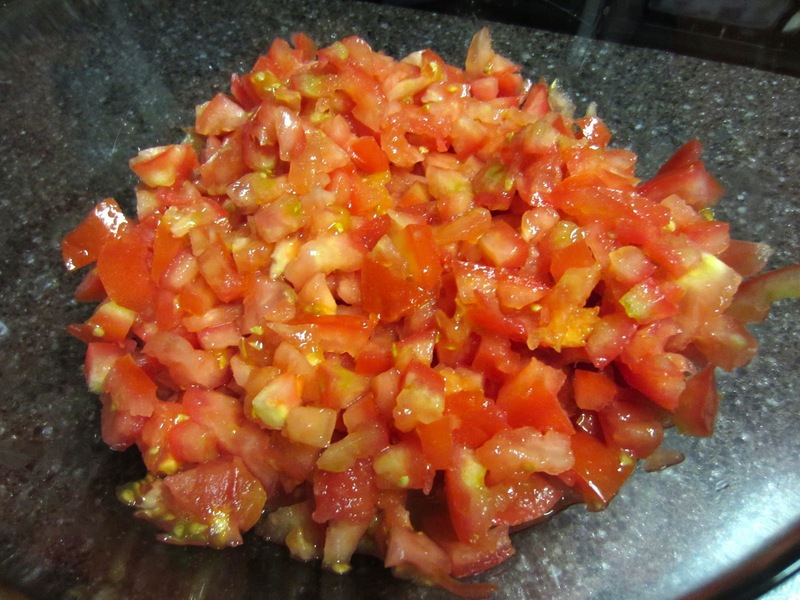 Coarsely chop tomatoes and add to bowl. Chop the garlic, and measure out basil leaves. The recipe doesn't call for cutting the basil leaves, but I opted to slice them up so there would be smaller pieces in the soup. 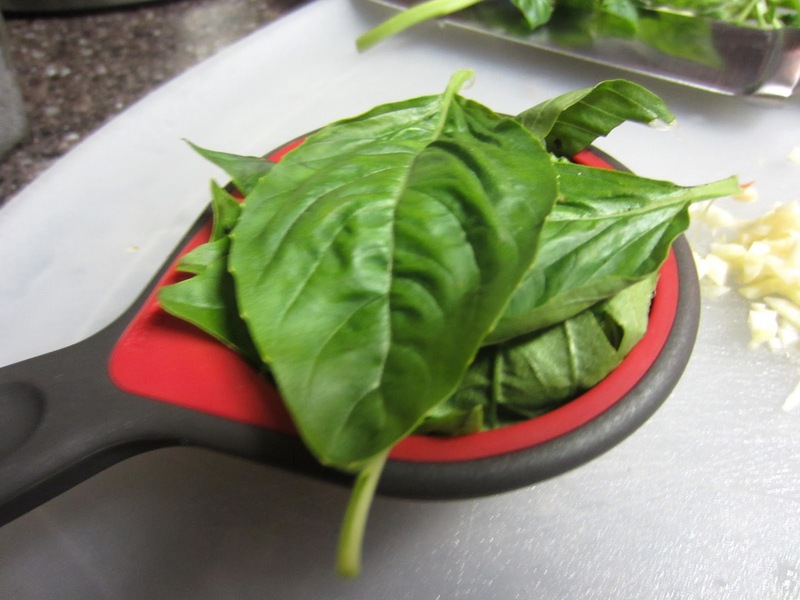 Either way, you will still have the basil taste in the soup. 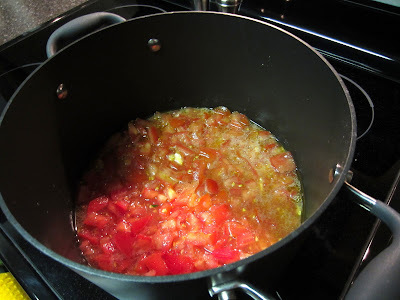 Measure out the rest of the ingredients and heat the oil only in a large pot over medium heat. Add the garlic and cook just until fragrant, about 45 seconds. Add the tomatoes and the broth. Bring to a simmer, reduce heat and cook 10 to 15 minutes to blend flavors. 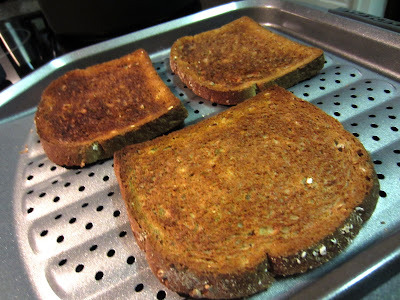 While the soup is simmering, toast your whole-grain bread. *TIP: to quickly toast, put the slices of bread in the oven and set it on the BROIL setting on HI. 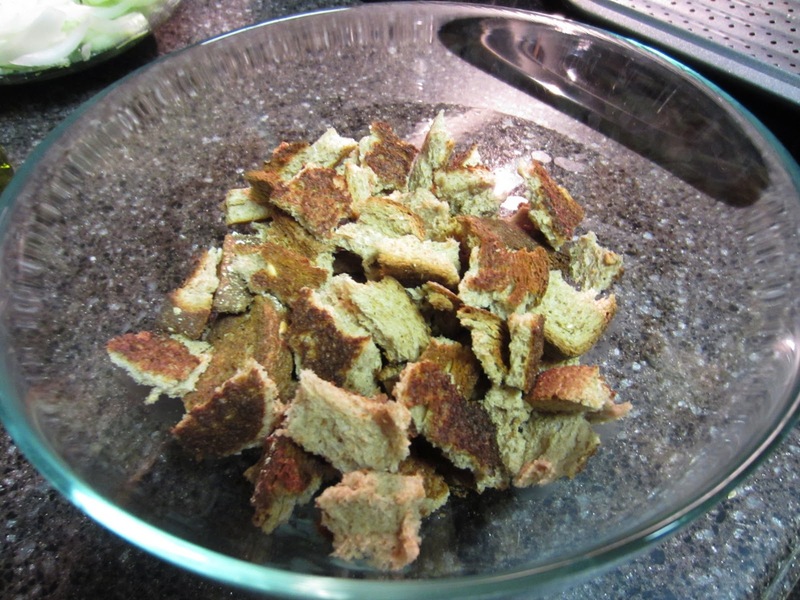 It will toast before you know it, and leave you plenty of time to finish the croutons before the soup is done simmering. Tear toast up into thick, crouton like chunks and put aside. 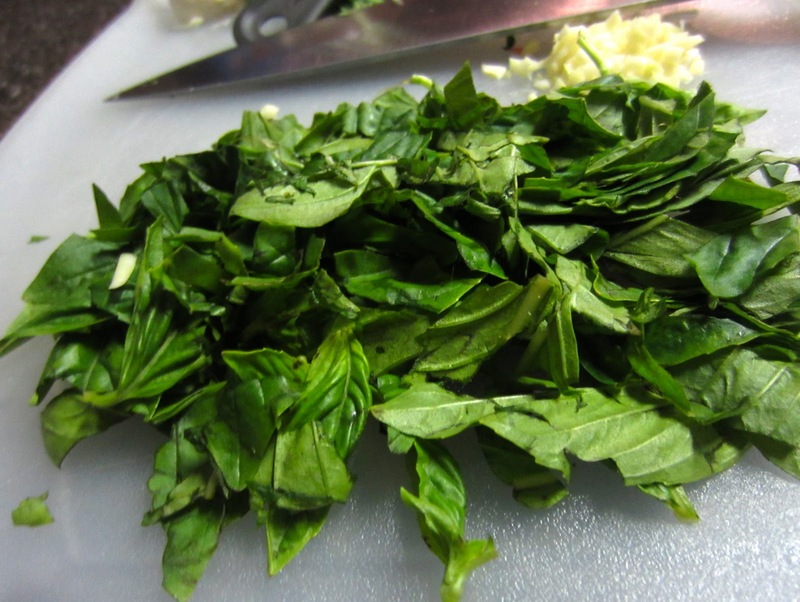 After 10-15 minutes of the soup simmering, stir in basil and season with salt and pepper. 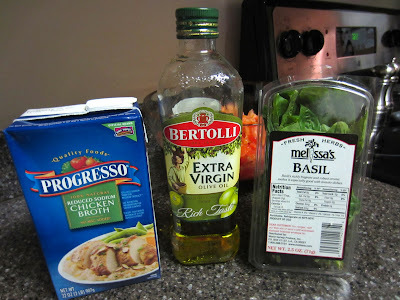 Spoon into bowls and top each with croutons and about 1 tablespoon Parmesan cheese. 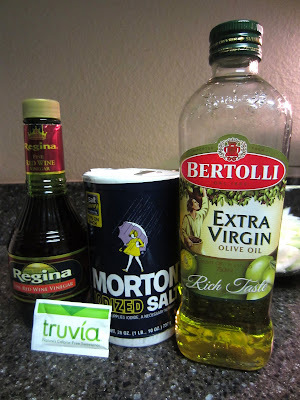 *NOTE: I did not add Parmesan into my recipe, but it would be a great addition for any of you trying this recipe. Scott and I are huge fans of soup & salad combos and frequent Panera Bread for their "you pick two" for lunch, or even dinner at times. The soup looked great, but I felt like I needed to pair it with something to complete the meal. 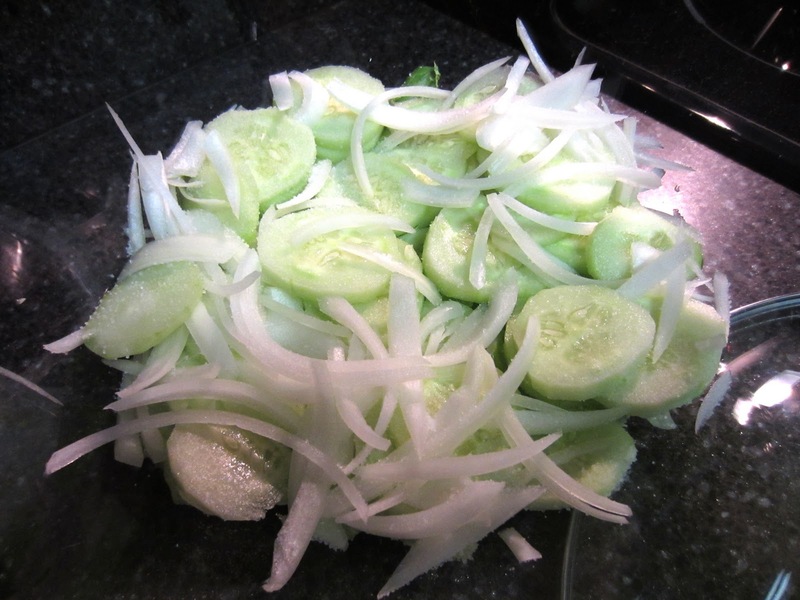 I found a simple cucumber salad recipe to serve with the soup and the "two" I picked turned out to be a great combo. I found this salad recipe on my SparkRecipes app and tweaked it a little to make the perfect pairing. The original recipe I found didn't include lettuce, but I enjoyed the extra greens. I wanted to keep the salad simple, since you're getting enough tomatoes in the soup. *Serves 2 - use a little over half a head of lettuce and add an extra tbsp of oil & vinegar to serve 4. 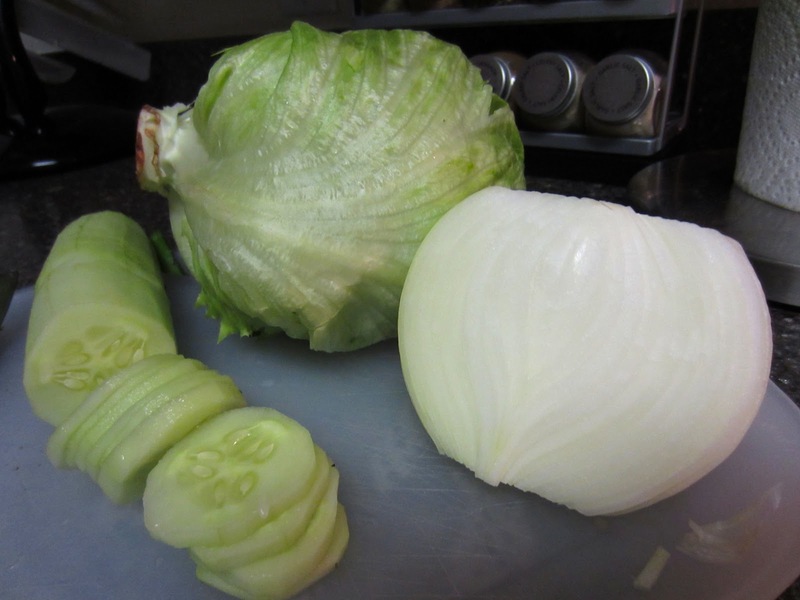 To make salad: Peel and cut the cucumber and onion. In a large bowl, combine cucumber slices and onion slices; set aside. If serving right away, add the lettuce now. If not, save the lettuce to add in right before serving. In a small bowl combine remaining ingredients. Instead of regular sugar, I added my favorite calorie-free sweetener, truvia. 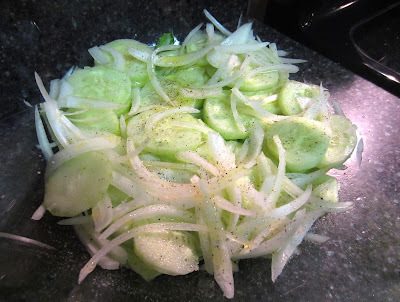 Add oil, vinegar, sugar, salt and pepper to cucumber and onion; toss well. If you want to prepare the salad before you make the soup, cover it without the lettuce and refrigerate up to 2 hours. 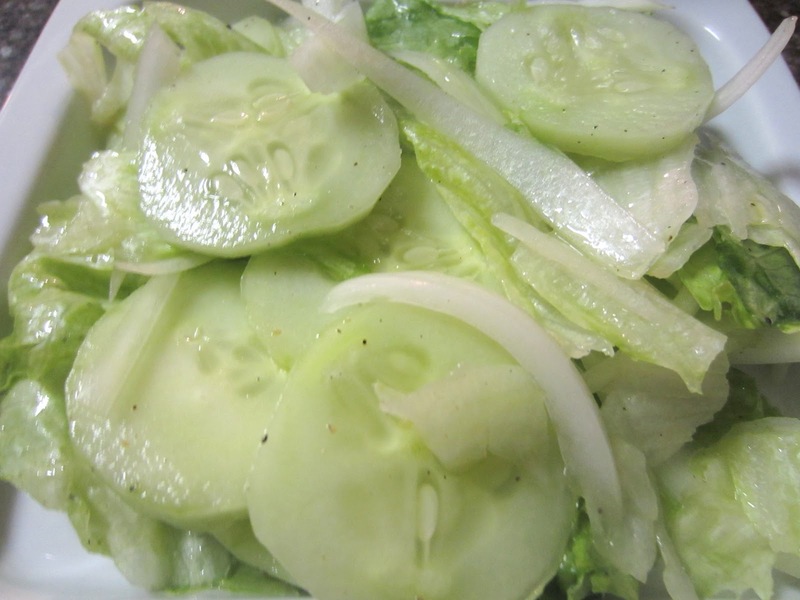 When ready, simply add the lettuce into the bowl and toss it with all of the refrigerated ingredients. 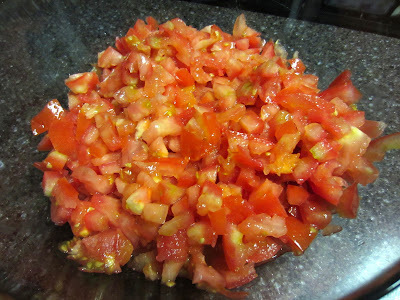 Dish salad onto a combo plate and serve with your Fresh Tomato Soup with Whole Grain Croutons! 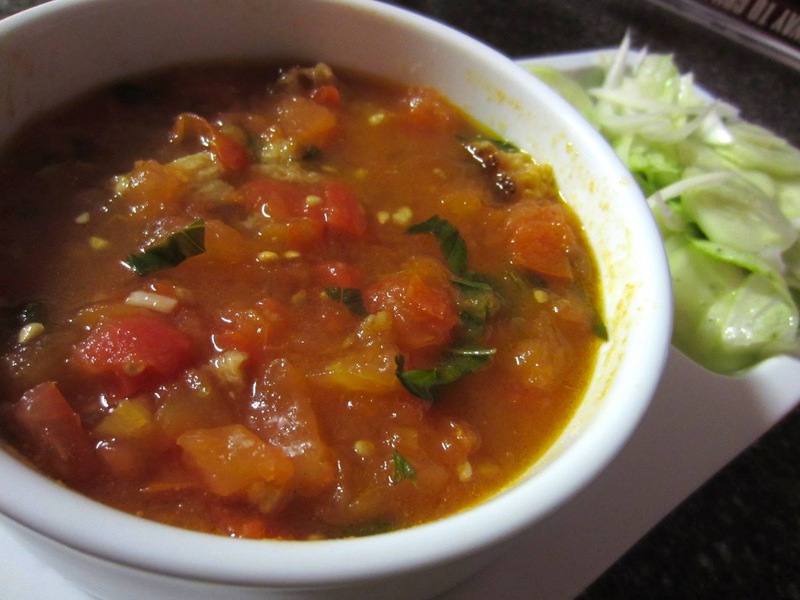 If you enjoy a great soup & salad combo, let me know how you like this one. Feel free to share your own favorite combos and let me know how this one worked out for you! Okay, I know the first question here will be what does WIO mean? In the blogging world, it's easier to use acronyms for phrases you will be referring to in the future. 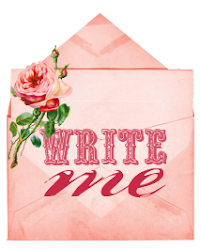 An example of this is when I was blogging for my wedding: I using MOH as Maid of Honor and DIY for Do It Yourself. In this case, WIO stands for Work It Out and represents a segment of my blog dedicated to working out and fitness tips. My first tip? DO CARDIO! The number one question I get from people about loosing weight is "what can I do to trim my waistline?" My number one answer? CARDIO! A huge part of keeping trim is your diet, but an equally important part of living a healthy lifestyle is fitting exercise into your every day routine. I know it is not a priority or even realistic to make a trip to the gym every day (or even every other day) but it's important to at least get in 20 minutes of any kind of exercise, whether it's playing a sport, walking the dog after dinner, or even taking a jog around the block a few times. When I was at my fittest, I somehow squeezed cardio into my daily routine - no matter what. I've been known to go for a run in the morning and then taking a spinning class followed by a weight training class after work when I'm getting ready for a photo shoot. I'm not saying you should do this...because overdoing it can cause too much wear and tear on your joints. What I would recommend to everyone is to fit a healthy cardio regime into your weekly workout routine. *WIO TIP: Always do a quick stretch before a running workout targeting your legs, calves, back and arms. I also encourage equipping yourself up with music, or watching television if you're inside of a gym equipped with one. There's nothing worse than being bored during a workout. Distracting yourself with some kind of entertainment will help you to stare at the clock as a time reference, not to count down time remaining in your workout. Well, you guessed it...the title means exactly what it says. You can use this workout on or off the treadmill, as long as you have a clock or stopwatch with you. Start your minute on-minute off workouts with a warm up walk for 2 minutes, at a 3.5mph speed. 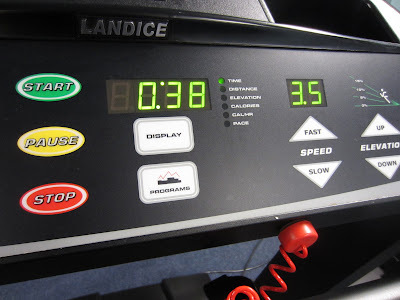 Every treadmill is different, so if you're not sure about how fast you should be going, it should feel like you are power walking, or taking a brisk walk. When you hit the 2 minute mark, up the speed to 5.0mph and increase your speed by 0.5 mph at each minute mark, until you hit 10 minutes. For example: at 3 minutes you will run at 5.5, at 4 minutes you will run at 6, at 5 minutes you will run at 6.5 and so on, until you get to the 10 minute mark. The 10-minute mark will start intervals, with the 10-11 minute being used as your first "minute off" rest time. Do this by splitting your feet on the sides of the treadmill, removing them from the belt. 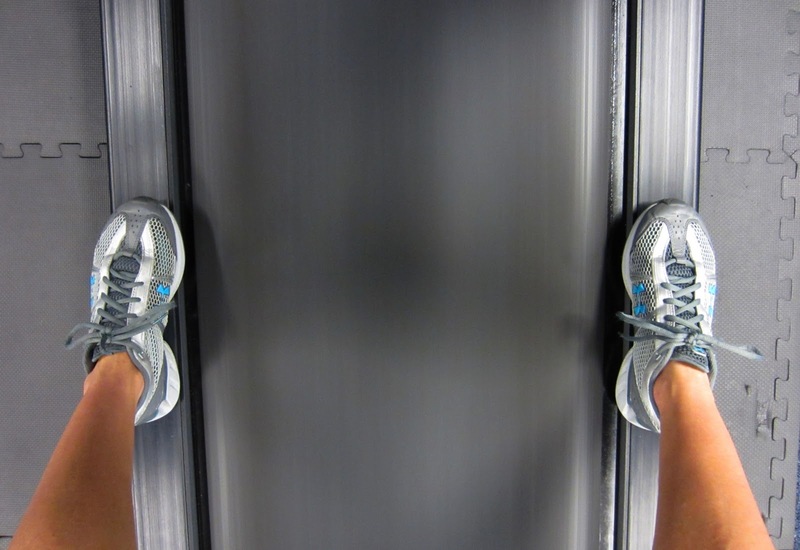 Use the handlebars of the treadmill for support, and place your feet on the sidebars. 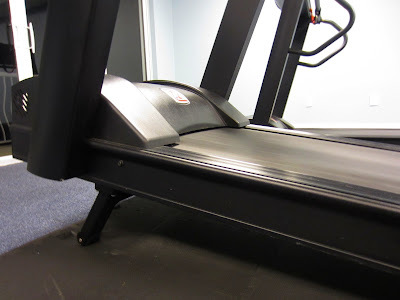 Literally, take a minute "off" of the treadmill to rest before you start your first interval run. *NOTE: some treadmills don't allow you to do this and will shut off with inactivity on the belt. If this happens, you can either carefully place your foot on the belt every now and then or change the running speed from 5.5 down to walking (around 3mph) every minute. When you get to the 11 minute mark it is time to kick it up a notch by increasing your incline. 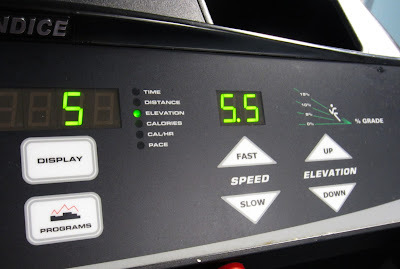 Again, it depends on the treadmill (some go up to 10, some go up to 20 or higher), but I go up to a level 5 on mine. This is actually a maximum incline, to show you what I'm talking about. It should be high enough that it's a challenge for you to get through a minute of running, but not impossible. Run at at incline of let's say 5 at a speed of 5.5mph. If at any time you feel your incline level is too high, decrease it. You should at least aim for the 5.5mph speed, and adjust your incline level accordingly, after your speed is set. 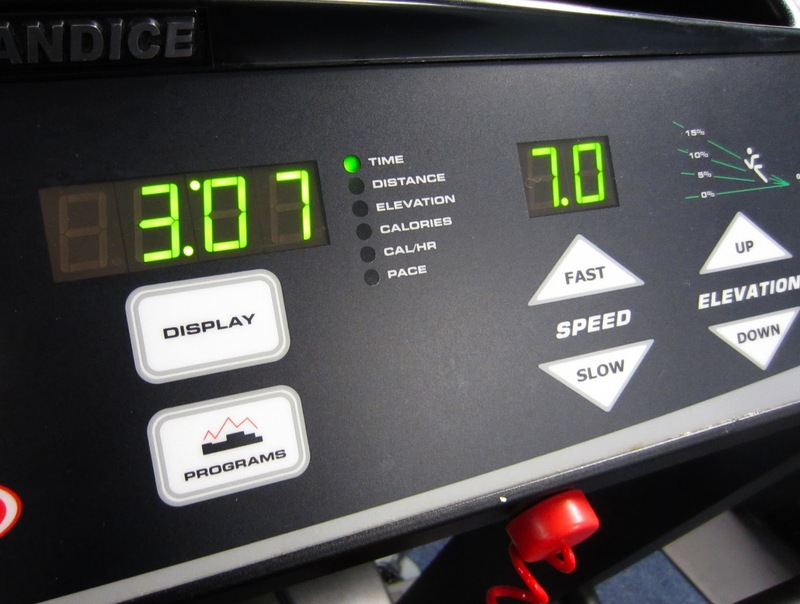 Run at your preferred incline for a "minute on", meaning for one minute from the 11-12 minute mark. When you get to 12:00, it's time for your second "minute off" and repeat placing your feet on the sidebars of the treadmill. Get ready for your next "minute on" at 13:00 and do your 2nd interval at the 13-14 minute mark. When you get to the 14:00, take your next "minute off", and repeat the cycle until you get to 10 intervals. If you complete all 10 intervals, you will end your last one at the 30 minute mark. Take your "minute off" at 30 minutes, but as soon as you can, lower the incline back to 0, and walk at your warm up speed at 3.5mph. Cool down by walking at this pace for 3-4 minutes and take your last minute of this workout slowly lowering the speed from 3.5mph to 0. Start your minute on-minute off workouts with a warm up walk for 2 minutes at a power walk speed. When you hit the 2 minute mark, get to a steady jog and keep that pace until you hit the 10 minute mark. The 10-minute mark will start intervals, with the 10-11 minute being used as your first "minute off" rest time. Slow down to a normal (not power) walking speed for a minute. When you get to the 11 minute mark it is time to kick it up a notch by increasing your speed to a full on sprint. Since you're not on a treadmill and don't have the incline to challenge you, it's important to make it hard by going has hard as you can for a full minute. 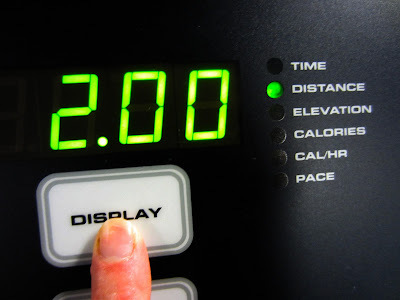 When you get to 12 minutes, take your 2nd "minute off" walk and repeat this cycle until you do 10 intervals. For example: do your next "minute on" sprint at the 13-14, do your next "minute off" walk at the 14-15, and so on. If you complete all 10 intervals, you will end your last one at the 30 minute mark. Use the last 5 minutes of your cardio time to cool down by walking back to your home, your car, or wherever you need to go. Interval workouts have been a key to keeping my cardio routine challenging. I prefer this type of running over a steady 30 minute run, and research shows that interval training burns more fat and calories than steady paced runs or jogs. And that should do it. Stay tuned for more cardio & WIO tips & let me know if or how interval training has helped you! Since we've gotten married and equiped with some great new additions for our kitchen cook & bakeware, both Scott and I have been dabbling in the kitchen and trying out new recipes. 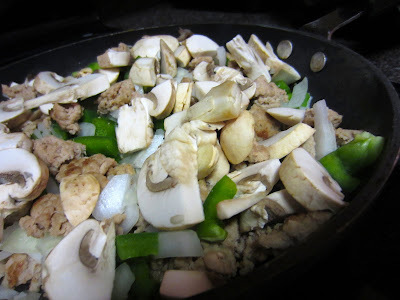 From breakfast food to dinner dishes I've come to realize that I love to dress my recipes up with veggies. If it's pizza, my motto for vegetables is the more the merrier. I've been known to order a veggie pizza or pasta and add meat into it for the protein. Even if you're watching your weight, there's no reason anyone can't have a bowl of meaty marinara every once in a while. This week, I channeled my inner Betty Crocker and created my own healthy version of one of my favorites - spaghetti bolognese. It's pretty simple make a few easy, healthier substitutions in order to still be able to eat the foods you love. Just keep in mind: when you replace any ingredients to make healthier choices it isn't going to taste exactly like what you're expecting...but it can come pretty darn close! *serves 2 - double ingredients for 4. 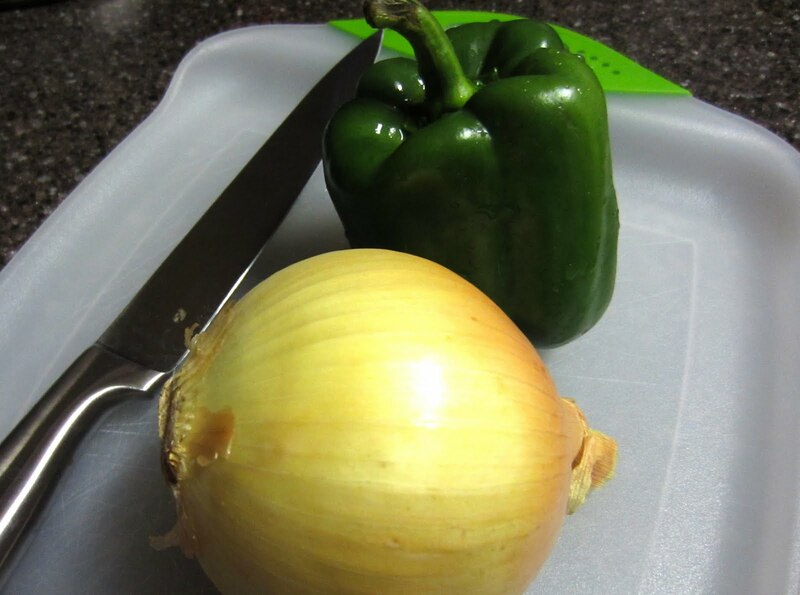 Adding veggies to any pizza or pasta sauce is a great way to sneak in the daily servings you need. Also, the more veggies you have in the sauce, the less marinara (or for pizza, cheese) you will need for substance. Veggies enhance the nutritional value of your meal, and can also change your once heavier sauces into tasty, lighter ones. To make pizzaiola sauce: Cut up the pepper, onion and mushrooms. You can make the chunks as small or big as you'd like, but I prefer a chunkier chop. 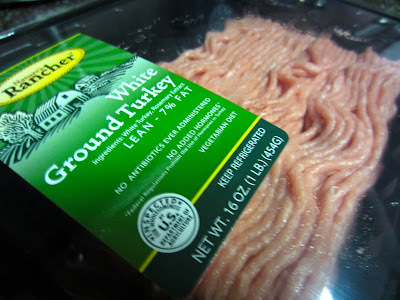 I used white ground turkey meat, but I have also used chicken sausage or extra lean ground beef as the protein for sauces. 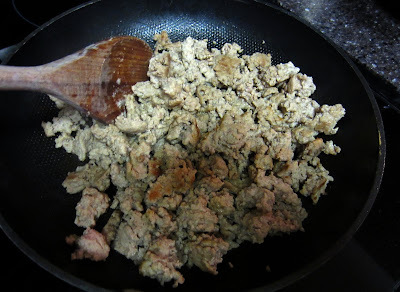 Ground the sausage in a medium sized skillet. It doesn't take that long for meat to brown, and when it is cooked all the way through add the vegetables straight into the ground meat to warm and soften them. 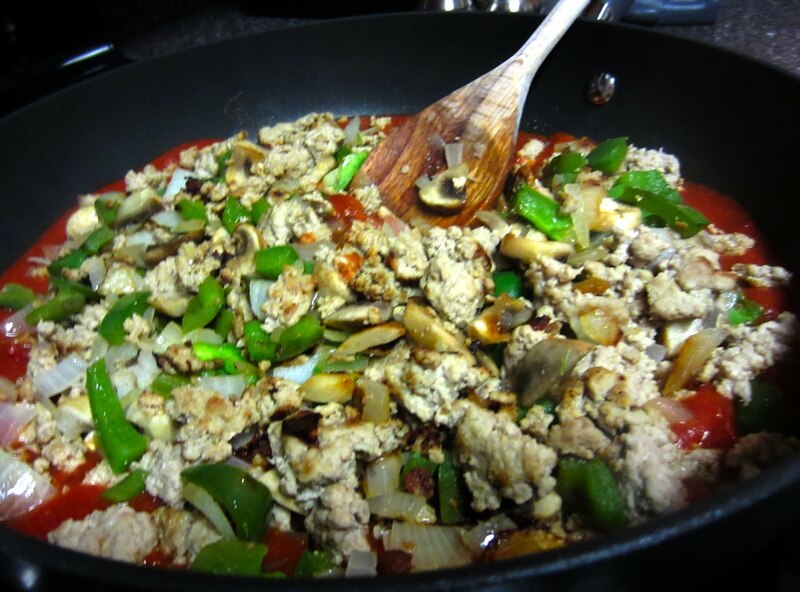 Saute the vegetables with the meat, and while you are doing so pour your can of tomato sauce into a large sized skillet or sauce pan on another burner. When you see the vegetables change to a slightly darker hue, they should be warmed up enough to add everything into the tomato sauce. 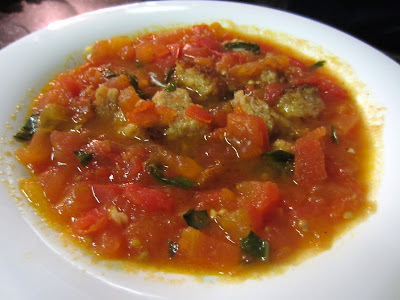 Get a large serving spoon and transfer the meat and veggies into the tomato sauce. Mix the sauce, meat and veggies together and warm the sauce. 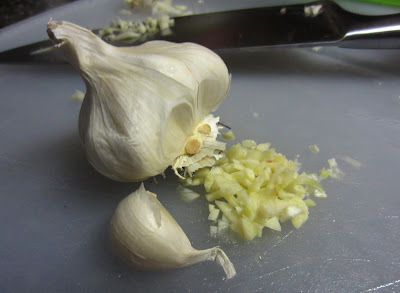 Add the oregano, basil and garlic salt and keep stirring sauce until it's well blended. Reduce heat to low (or simmer) and cover. 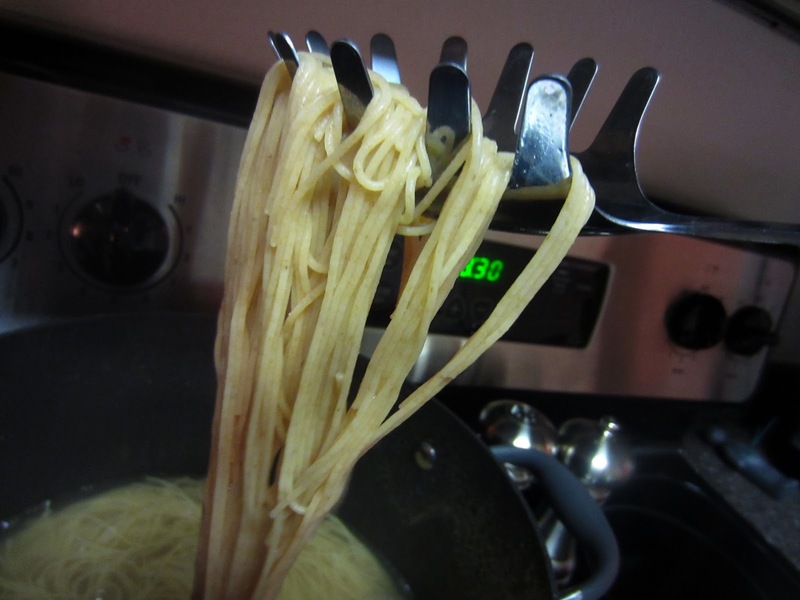 In a large sized pot, heat water for the noodles and add them in as soon as it starts to boil. Cook for the amount of time directed on the box of noodles (usually 8-10 minutes) and test to make sure they're soft enough to serve. 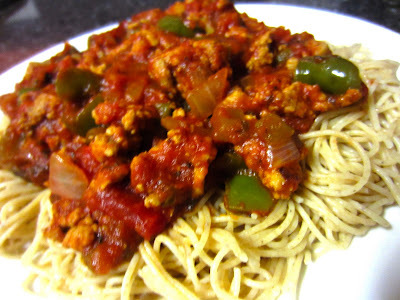 Drain noodles, uncover the skinny pizzaiola sauce and plate up!